When considering present opportunities in the residential energy storage market, we need to ask ourselves two things: 1. Is it viable and 2. Is it adoptable; perhaps not in that order, though. Residential energy storage viability has a lot of aspects to it, both in categories and to whom it applies. There’s financial viability and functional viability to name the top two, and the players range from technology mind smiths to manufacturers to retailers (likely to be utilities or utility/producer partnerships, and power purchasing agreement providers) to end-users whose sense of viability is the foundation of adoptability. With adoptability, what we’re looking at is the public’s current and potential willingness to embrace the technology, not to mention prospective sellers’ interpretation of this market segment’s interest level, which could prompt or discourage them to get the word and product out there. Putting aside industry-wide speculation and the assumptions of the interested public (that energy storage is simply the key to all our energy problems), let’s look at some direct applications that show us where community and residential energy storage (CRES) is succeeding right now and how it spotlights growth potential. Earlier this month, we saw Panasonic Corp. beginning mass-production of a compact lithium-ion (Li-ion) battery storage system for the European residential market. This kilowatt scale battery production comes in addition to the company’s recent move to increase investing in development of large-scale energy storage, namely with a largely publicized partnership with Siemens. Answering the question “Why now?” we can address both questions of viability and adoptability in the market. In countries across Europe, motivated to reduce energy costs and by increasing government pricing incentives, there is a greater and growing movement among residents to adopt rooftop solar. Panasonic is simply pursuing an opportunity in the market to provide complementary technology to home PV adopters, particularly after piloting a successful program in partnership with the German engineering firm E3/DC to install battery storage systems in households in Germany (Panasonic supplied the Li-ion batteries for E3/DC’s systems). Here, market opportunity is demonstrated in consumers’ investments in both on-site renewable technology and the complementary storage tech that optimizes their investments. In Korea, $64.5 billion of cleantech monies are being invested between 2009 and 2013 on Jeju Island in what is expected to become the world’s largest Smart Grid community. The investment naturally includes advanced CRES technologies, research and development to greater innovate solutions, and concentrated development of business models needed to help make energy storage successful in small-scale markets. On this side of the pond, there have been a number of programs piloted to test and then scale residential battery energy storage adoption in recent months. Late last year, the California Utility Commission awarded $14.6 million to CRES research and development, including $1.8M to residential photovoltaic company SolarCity to research the feasibility of storing electricity generated by rooftop solar arrays in batteries provided by Tesla. Similar research and community pilot programs have sprung up across the U.S. The battery system stores excess, i.e. unused, energy generated from the household’s rooftop PV system during strong daylight hours, energy that would otherwise in most cases be transferred back to the grid. Later, when the PV system is no longer receiving solar rays, but when the home requires more energy for lighting, among other things, the system signals to retrieve the reserve energy stored in the battery system vs. acquiring it from power line connections, i.e. the grid. Two other ways it “works” or rather, two big benefits of residential energy storage, are load reduction during peak hours, i.e. by routing excess energy to the BMS instead of the grid (this means grid systems are not taxed with intermittent and unknown/unexpected surges of energy) and cost savings as seen on consumer electricity bills (consumers save money in both uptake and downtake fees from their local utility). Basically, the systems reduce stress on both sides, promoting energy independence. This also carries obvious environmental benefits inherent in using renewable energy over conventional fossil fuels (reduced CO2 pollution, less depletion of natural resources, etc. ), but with a boost in efficiency, i.e. less electrons lost in the process. In and of itself, of course, BMS technology for domestic use does nothing. It requires pairing with an energy source (not exclusively renewable), so questions of viability and adoptability require keeping an eye on how well installed energy solutions, primarily rooftop solar, are being embraced by consumers in thought and deed. While a small number of residents, much like larger-scale commercial energy storage users, may adopt battery storage technology to optimize off-peak grid-based energy purchasing (electricity is generally cheaper when there is less need and more local production, and where the region allows peak-based pricing), the return on investment is poor in light of the minute differences of energy costs as viewed on the domestic scale, and where it is even an option. This leaves residential energy storage to be primarily, if not exclusively, a complementary technology paired with on-site renewables. Many of these solar industry insights can be found via Solar Energy Industries Association and particularly in the 2012 Q1 Solar Markets Insight Report (Executive Summary). 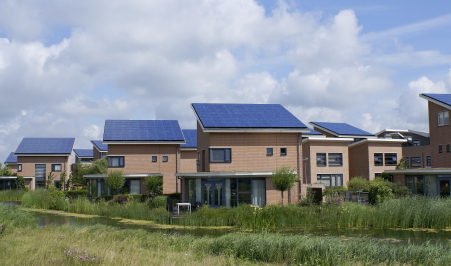 Pike Research forecasts the growth of installed capacity for community and residential energy storage will take the just-shy-of double-digit MW figures of 2012 all the way to 800 MW in 2021. Considering most home BMS support a range of 1 – 10 KW, that’s an estimated growth of between 2,000 and 9,000 homes this year to between 50,000 and 700,000 homes in the next ten years, and Pike confesses these figures to be very conservative. If you are a homeowner interested in purchasing battery storage to work with your current or planned solar array, NREL (National Renewable Energy Laboratory) has a handy two-page PDF on user-end battery basics called Battery Power for Your Residential Solar Electric System. If you are a residential developer, PPA provider or solar leasing company, or community organization interested in discussing lithium-ion battery storage options for your homes and the homes of your clients, contact BeVault and we’ll talk you through your options, answer any questions you have, and help you design a solution that optimizes onsite solar investment.